Recorded in a range of spellings including the famous Wingate, Windeatt, Wingatt, Wingeatt, Whinniatt, Wynyates and no doubt other, this is an English surname. 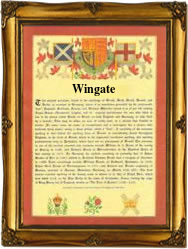 It is locational from some place such as Wingate in Devonshire, or Wingates in Northumberland, or Winnats in Derbyshire. All have much the same meaning and derive from the Scandanavian word "geat" which does not usually mean a gate, but refers to a road, and in this case one which is very exposed to the wind. Locational surnames are usually "from" names. That is to say names given to people as an easy form of identification after they left their original homes and moved somewhere else. Spelling over the centuries being at best erratic and local accents very thick, often lead as with this surname, to the development of "sounds like" spellings. Early examples of the surname recordings taken from surviving rolls and registers of the medieval times include those of: Aldret de Windegate of Northumberland, in the year 1145, and Henry de Wingate of Kent, in the Curia Regis rolls of 1204 and in the reign of King John (1199 - 1216). Orde Wingate was one of the most successful British generals of the Second World War, until killed in Burma in 1944.